Rice is godly. If there is any food that has traversed as many cultures and countries as rice has, over the thousands of years of its use as a staple of countless world cuisines, I’d be willing to call it godly as well. Don’t believe me about rice? Go buy about 15 plane tickets and I’ll prove it to you. Or you could visit several local restaurants. Mexican? Black beans and rice are served with virtually every meal. Rice is even stuffed inside an authentic (or even Chipotle) burrito. Indian? Basmati rice accompanies nearly every curry dish. Middle Eastern? Order some kabobs or kefta or shwarma and you’re sure to get some rice pilaf alongside. South American? Arroz con pollo is everywhere. Chinese? Fried rice or white rice. Served with nearly every meal. Cajun? Dirty rice is a killer staple down there, in more ways than one. Rice is also the base and most important part of authentic jambalayas and gumbos. Thai? I think the only Thai food I’ve ever eaten had the words “rice bowl” on the end of it. Spanish? The national dish of Spain is paella. Let’s just say, when you’re loading chicken, shrimp, mussels, clams, fish, sausage, peas, tomatoes and more on to a rice texture and flavor base, that rice is critically important. And I think any Spaniard, or anyone whose ever eaten paella, would concur that the rice has to be perfect. Korean? If you haven’t tried the popular Korean rice dish, bibimbap, topped with a myriad of colorful veggies, an egg and a load of meat, it’s pretty darn good. Japanese? My favorite: sushi has rice on every single piece. San Francisco? Rice-a-roni! Kidding. But you get my point by now. And I didn’t even mention the multicultural classic dessert, rice pudding. Now that you’re hungry for rice, I’ll give you a recipe that I created where rice is the star. 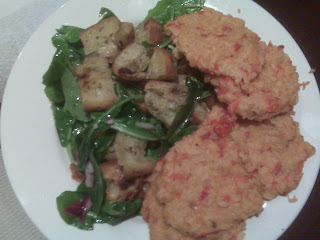 Crispy Italian Rice Patties over Salad. First make some rice. I like using brown rice because of the positive health benefits like fiber, and in this dish there is enough supplementary flavor to make up for any perceived flavor deficiency in brown rice. It doesn’t really matter the type of grain you use here, but a standard short grain is fine. I would make one serving of rice for each person eating the meal, based on the serving sizes and directions located on the package of any rice you may have. I’ll assume below that you’re cooking for 3-5, but you can easily adjust for any number. Once you have carefully followed the specific rice directions, put the rice into a glass mixing bowl and let it cool somewhat. In the mean time, finely dice up two large roasted red peppers and a large handful of sundried tomatoes (maybe ten). Then finely chop two or three leaves of basil. Add the peppers, tomatoes and basil to the rice, along with 2 tablespoons of extra virgin olive oil, the juice of half a lemon, 1 egg, half a cup of (whole wheat) bread crumbs and a small amount of salt and large amount of fresh cracked pepper. Now, clean your hands and dig them in to the bowl and mix the ingredients carefully but well. Continue mixing until the ingredients are well dispersed and the rice has a “sticky rice” type of consistency. If it’s not sticky enough, you might need to add a little more egg or bread crumbs. Next, form the rice into little patties or cakes. They should be about two or two and a half inches in diameter and no more than half an inch thick. Place them in a single layer on a baking sheet or plate(s) and ideally cool for at least 15 minutes in the fridge. The cooling will help the patties stay together. Now, wash your hands! To be honest, I have never actually tried baking these, but it should only take about ten minutes in a 400 degree oven to finish these off. However, with something like these patties, you’ll get a really nice result if you lightly pan fry them. You need very little oil – cooking spray even works – heated medium or a little higher in a pan. Cook them in batches so that the patties are never touching one another in the pan. Put each one down and don’t touch it for two minutes or until browned and crispy. Then flip so the other side gets crispy. Keep doing the batches until all the patties are done. Serve over mixed greens tossed with a light vinaigrette (maybe lemon juice, olive oil, white wine vinegar, salt and pepper). The patties should have a perfect texture, with a nice crispy outside and soft, creamy inside. That texture, along with the great flavor combo will go great with the cool, crunch and tang of the salad. If you don’t understand the beauty of rice yet, you will after you try this dish. I suppose you could just go to any country’s restaurant (above) and be convinced, but patronize me and try this. It won’t disappoint.